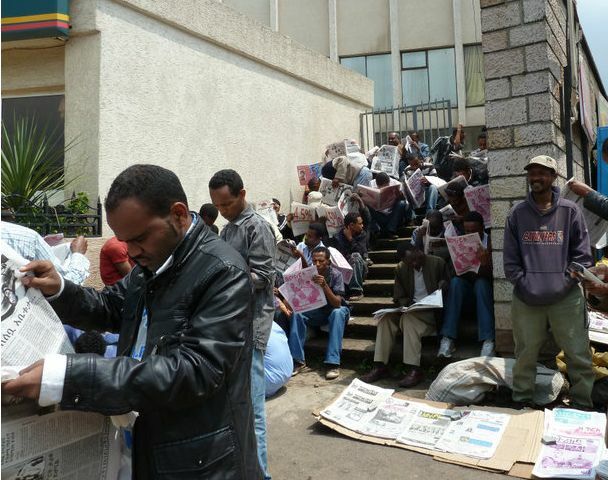 (OPride) — Ethiopia’s trials with press freedom and assembly have become almost proverbial. The government has devised several proclamations and directives to stifle freedom of opinion and expression. As a result, dozens of newspapers and magazines have vanished into thin air. Dissident journalists are harassed, jailed or forced into exile. The recent crackdown on six bloggers and three journalists, who now face charges of working with foreign human rights groups and using social media to incite violence, is but a fresh anecdote. The Ethiopian government has been jailing journalists, human rights activists and opposition leaders using its sweeping Anti-Terrorism proclamation. Only its archenemy Eritrea holds more journalists behind the bars in the continent. In May 2012, authorities issued a directive requiring printing houses to remove any “illegal” content from their publications. The unduly broad provisions of the Anti-Terrorism Proclamation guaranteed any content, even those remotely critical of the government, could be deemed illegal. Almost all news, opinion and human rights websites are blocked inside the country. It is under this context that journalists, activists and politicians have been trying to raise the scepter of atrocities and rights abuses in that country. The government remains indifferent to international calls for liberalization and for opening up of the media environment. These legislations have also made it impossible for local and international human rights organizations to freely operate and investigate authorities actions. As a result, many have drastically scaled back their activities while others were forced to close down altogether. In order to make do under the circumstances, most independent journalists judiciously practice self-censorship, to the extent that many simply refrain from reporting on issues related to “democracy and human rights.” The press being handcuffed and the chocking of media houses have discouraged the public from coming forward and expressing their grievances and opinions. Critical journalists are monitored by state intelligence, leading to an ever-present fear of reprisals and prosecution under the anti-terror law. As a result, most local media houses completely disregard reporting on “sensitive” topics, or simply provide one-sided coverage coloring their reports with developmental buzzwords. The Oromo make up an estimated 40 percent of Ethiopia’s 92 million population. For decades, Oromo activists and leaders have been raising questions of freedom, justice and equality. However, many of these questions never received adequate responses in any meaningful way. The Oromo question remains the bottleneck of Ethiopia’s own existence as a state. Addis Ababa, which Oromos call Finfinne, sits at the heart of the state of Oromia, for which it also serves as the capital. In recognition of this positionality, but more importantly the city’s historic significant among the Oromo, Ethiopia’s constitution guarantees “special interests” over the city to Oromia. For the last 23 years, Oromos have been asking the government to implement the “special interest” clause. But the government kept on turning deaf ear to these requests. Instead of allying existing grievances, the government came up with an “Integrated Development Master Plan,” as a means to gobble up more than 15 surrounding Oromia towns under Finfinne. This scheme to ‘annex’ more Oromo land in the name of “development” led to Oromia-wide opposition spearheaded by high school and college students. Since April 25, 2014, students from various universities in Oromia have staged peaceful protests, urging the government to withdraw the plan and respect their state’s “special interest” over the city. Security forces brutally suppressed the protests, killing dozens of unarmed students, and leaving hundreds injured or behind bars. Others completely disregarded the matter and kept to their business as usual. For example, Addis Fortune, a weekly English newspaper with 10,000 monthly circulations, devoted only one single sentence to the protests its May 11 report about the master plan. Unfortunately, Finfinne-based foreign correspondents also kept to the official line. The Associated Press carried a police statement, and even went a step further linking the protests to secession and Oromo Liberation Front. 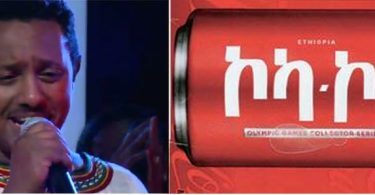 Bloomberg News published a brief report with comments from Oromo opposition leader and the state-run Fana Broadcasting Corporate. Reuters simply ignored the news. In a nutshell, independent, objective journalism has essentially become a crime in Ethiopia. Given the highly restrictive media environment, Ethiopia’s “independent” press continues to teeter on the edge of death and survival. Under the circumstances, a lot of journalists have begrudgingly embraced the “developmental state” storyline. For others, strict self-censorship has become more of a norm. As a result, the professionalism and quality of Ethiopian journalism has been significantly compromised. Still more concerning is the inherent ideological and institutional bias toward coverage of “ethnic” stories, particularly stories about Oromo activism. The role of a journalist is to report on events as objectively and truthfully as possible. Journalists should act as non-participating spectators of events. 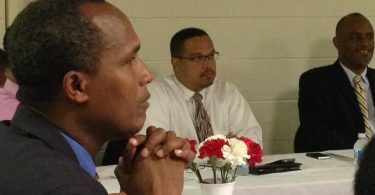 When reporters become part of a story or offer their opinions, they are expected be transparent and issue a disclosure. These ethical values are rare in Ethiopia. However, if there’s any hope for future of Ethiopian journalism, Addis Ababa-based media houses should start checking their ethnicized and detached coverage of events outside of the capital. Correction: The original analysis noted Bloomberg News “repurposed a government statement, with a passing reference to opposition leaders.” This was a mistake introduced during editing. The Bloomberg article leads with a comment from Bekele Nega, an Oromo opposition leader and references Fana BC on details of bomb blast at Haromaya University.